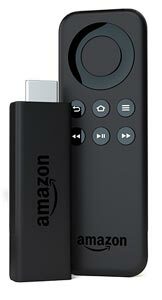 In a nutshell: The Amazon Fire TV Stick is probably the cheapest way to add Smart TV functionality to your TV. The compact stick brings access to Netflix and Amazon Instant Video, plus dozens of other video and music streaming services, plus games. It's easy to install, and portable too, making use of Wi-Fi to stream content from your broadband internet connection. The Amazon Fire TV Stick costs just £35, and brings all the benefits of Smart TV to your existing television in the easiest possible way. Plug the neat little stick into a HDMI port on the back of your TV, plug it into a mains electrical socket, connect it to your home Wi-Fi network, and you're done. That's the promise Amazon makes, and it really is that simple, as long as you have a good Wi-Fi signal and a reliable internet connection. Amazon Prime and Netflix require a monthly subscription, but many of the other services are free. You get a 30-day free trial membership of Amazon Prime to try out Amazon's Instant Video streaming content of popular movies and TV series. The list of services includes many more in addition to the most popular ones listed above. 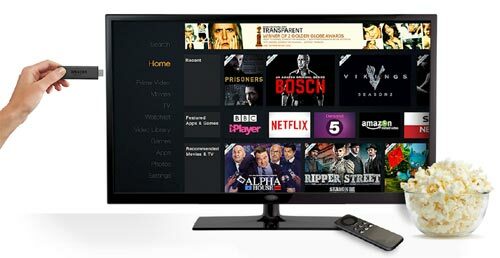 Amazon Instant Video uses a system called ASAP (Advanced Streaming and Prediction), which learns about your viewing habits and buffers your favourite TV series ready for play. These features really do make a difference, and the Fire TV Stick, despite its low cost and tiny size, makes everything run smoothly and without a hitch. A mobile app for Android and iOS lets you control the Fire TV Stick from your phone or tablet. You can use this to navigate, search, and to play games. The app also supports voice searches. You can also mirror your phone or tablet to your TV if you have a compatible device. The Fire TV Stick itself is tiny, and plugs into a spare HDMI socket via the HDMI extender supplied in the sales package. It also needs its own mains electrical connection. The device uses your home Wi-Fi connection to stream content. This makes it really easy to use, but we wish Amazon had included an option to connect an ethernet cable, in case you don't have a strong Wi-Fi signal in the room where you watch TV. If your Wi-Fi signal isn't strong, or if your broadband internet connection is slow or unreliable, then you may experience problems streaming content. It goes without saying that you'll need a spare HDMI connection to plug in the device. In principle the device is portable and can be moved from room to room and plugged into different TVs. You could even take it on holiday with you and use it to access TV content, provided that you have a Wi-Fi connection. Currently the Fire TV Stick is selling at £35, which is cheaper than Google's Chromecast device. It's much cheaper than upgrading to a new TV, and even an entry-level Blu-Ray player will cost you more. If you don't already have a Blu-Ray player, it might be worth considering buying one instead, because for around £50 you could get a box with Smart TV functionality and the ability to play disks too. Smart TV has moved from being a gimmick or a bonus to being a core part of the TV experience. If your TV doesn't support the latest Smart TV features, then the Fire TV Stick is the cheapest way to bring it up to date. It's not the only way, and you should consider options such as upgrading your TV, Blu-Ray player or set-top box. But for simple convenience and economy, the Fire TV Stick wins. Our TV doesn't have an HDMI port. Will a Firesick work if I plug it into a USB port on our Humax box? We only have one USB port available and it is in our Humax box. I am just looking into this myself, I have the same situation as yourself there Roger. I have learnt that as the HDMI port on the human box is an input, it will not then send this signal to the TV. Which is a shame. However, if your TV has a spare scart socket, then it seems possible to connect the firestick via a HDMI to Scart converter box. In theory then you could run the humax on one scart, then change the input and flick over to the firestick! I haven't tried this myself yet, but reading through pages of Internet searches for 'hdmi to scart converter' I think it may be possible. One thing to be aware of however is the firestick is HDMI 2 apparently. My old tv does not have HDMI port. Does a firestick plug into the HDMI port on a freesat box? Can't get any power to turn it on! Done every troubleshoot. Won't play. Agree with buffering... it's awful with iplayer!! Internet fine and works with Amazon movies and Netflix fine!! Also tv player most ch4 programmes are blocked. iPlayer always buffers, but it's the same using a PS4, so I blame the BBC! What size broadband do you use please? Outstanding packaging worthy of Apple. Very easy to setup and get going. Simple and very smooth operation. Streaming is very good even though I have a dreadful internet connection of only 3mbps. Quite amazing really. If you use Prime then it really is a no brainer. We moved from our old LoveFilm account at �6 per month to Prime at �79pa. Absolute bargain.